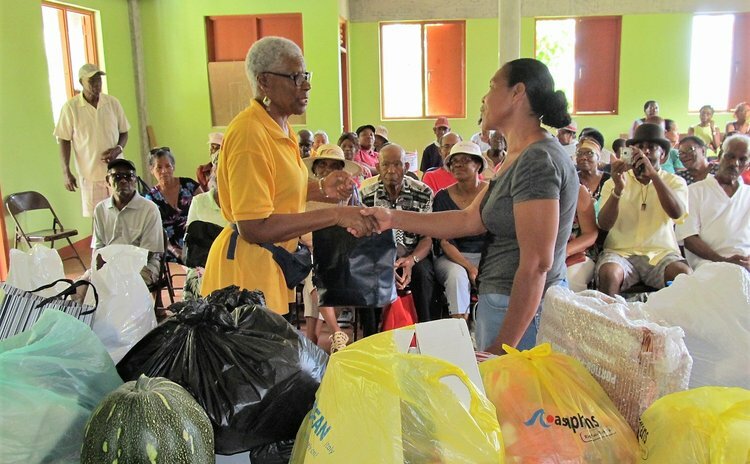 A trip to Kalinago Territory by Dominicans Welfare and Hospital Aid Scheme (DOWHAS) became a double event for the party of 50 members, friends and drivers on Saturday March 24, 2018. DOWHAS planned a tour of the Kalinago Territory to see the after effects of Hurricane Maria. In that planning process the organisation decided to bring along and donate gifts of clothing, food items, toiletries etc. to people who needed assistance in the Territory. The group met the Sineku Seniors Group, 13 years and counting, headed by the ebullient Pam Frederick. She told DOWHAS that she'd tried on several occasions to pass on the leadership to someone else, but her group of men and women and their families had confidence in her leadership and were not about to change something that was working. Mrs. Frederick and members of her community received the DOWHAS party about 1:00pm outside of the Sineku Community Library and escorted her guests to the upstairs community centre. There Mrs. Frederick led the group in singing songs of praise and worship and prayer and also invited her members present to introduce themselves before Lorna John Charles-Dalsan, representing DOWHAS, explained its mission. Ms Dalsan went on to present the gifts to Mrs Frederick. She was profound in her thanks and informed her guests that she would ensure that some of the items would go where they were originally consigned to. DOWHAS had brought along their lunch and carried the two big containers of packed lunches upstairs. In the end, all present shared in the pelau, juice, water champagne, wine and cream sherry available. And everyone was satisfied. The next stop was to visit Mrs. Elizabeth Frederick (known as Ma Willie) at Hilton Hill, Crayfish River. Mrs. Frederick celebrated her 104th birthday on Wednesday March 21. She is cared for by a daughter Ms. Jennifer Tyson. Members of the tour party made their way to Ma Willie's home; took photos of her and with her, passed the hat around and came up initially with $104 before some retrieved their purses from the transport and added to the amount which came to $142. Her granddaughter said Ma Willie had 12 children, six of whom were alive. Asked how many grandchildren there were, she said her mother alone had six and so she did not know, except that there were many grandchildren, great grandchildren and some great great grandchildren. The DOWHAS group were impressed by Ma Willie who looked younger than 104. Her main problem was her eyesight; she could not go outside to do some of the things that kept her strong.